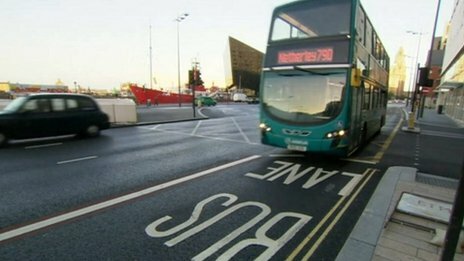 The enforcement of bus lanes in Liverpool will remain suspended until November, the city's mayor has announced. A nine-month trial introduced by Liverpool mayor Joe Anderson was due to end later this month. But due to the amount of roadworks taking place in the city centre, the council has decided to continue the suspension. Mr Anderson said the extension will be used to help gather data. He said: "We wanted to get a better and clearer picture of what effect the suspension is having. "I want us to be certain we've got a clear picture before we make any big decisions and we need to be sure if it is the roadworks or the bus lane suspension making the difference." The suspension was introduced by the mayor in October to improve traffic flow in the city. However, the idea has been criticised by bus company Arriva and the Green Party, who argued that bus lanes do work in the city centre. Tom Crone, Green Party councillor for St Michaels ward, said: "We want to promote people using buses to reduce congestion. If we push people into their cars we will only have more pollution. "Pretty much every European city is investing in and supporting their bus lane network. It's only Liverpool that's in this questionable position."